During the ceremony the Staff Captain Mr. Andreas Etzien together with the General Manager Mr. Fabian Leonhardt exchanged placards with the representative of the Ministry of Economic Development, Mr. Luelo Girigorie (Secretary General ad interim), and Director of Maduro Shipping, Mr. Albert Elens, who is the agent of the ship, in the presence of delegates from Curaçao Ports Authority, the Immigrations and Customs. 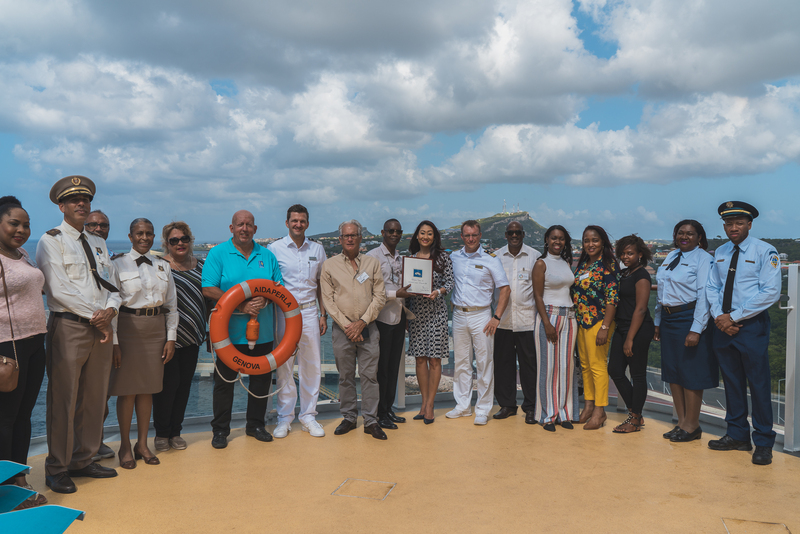 During the speeches, the Captain and crew were welcomed in Curaçao, hoping they would have a pleasant stay here and that they will visit our beloved island more often. Aidaperla docked last Sunday at 6:20 am at the Mega Pier Jackie Voges and left at 9:30 pm. 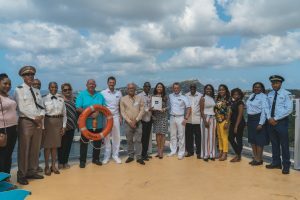 This 14-day cruise departed from La Romana, the Dominican Republic, on January 10, stayed one day at sea and arrived in Aruba, followed by Curaçao, Bonaire, Granada, Barbados, St. Lucia, St. Vincent, Martinique, Guadeloupe, Antigua to end again in La Romana. This is the twelfth ship of Aida Cruises with a length of 300 meters and a 125,572 gross tonnage. It has a maximum capacity of 4,350 passengers. Last Sunday it arrived with 3,436 passengers and 900 crew members. What makes the ships of Aida Cruises different from other cruise ships is the ‘smile’ on every ship reflecting the smile on the lips of every crew member to constantly provide excellent service.